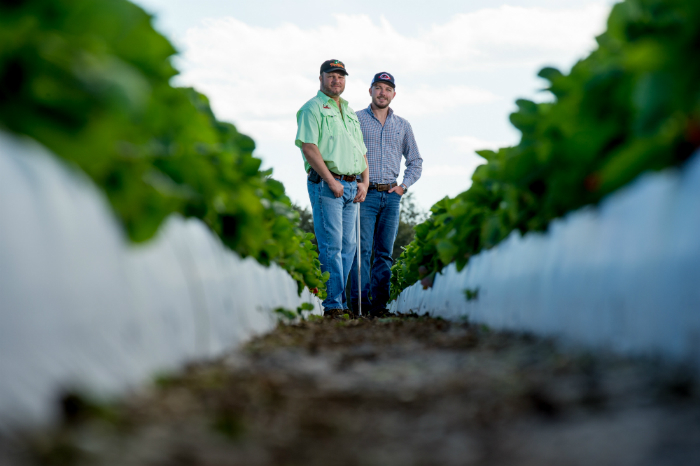 Fancy Farms, a strawberry farm in Plant City, Florida, is one of the five winners of the Fertilizer Institute’s 4R Advocate Award for 2019. The award is being presented this week during Commodity Classic in Orlando, Florida. Dustin and Carl Grooms of Fancy Farms will be recognized, as well as Jerrod Parker of Chemical Dynamics as Fancy Farms’ fertilizer service provider. Fancy Farms is the fourth company from Florida to receive the national award. According to the Nutrient Stewardship website, this award has recognized 80 agricultural producers and retailers who manage 175,625 acres in 20 states. The winners are recognized for implementing 4R fertilizer management practices on the farm to increase production and reduce environmental impact. 4R stands for right source, right rate, right time and right place. Carl and Dee Grooms began Fancy Farms with only 15 acres of strawberries. Through hard work, dedication and being stewards of the land, Fancy Farms now produces 170 acres of strawberries. Carl and Dee’s son, Dustin Grooms, took over the operation in 2007. Keeping in mind the nutrition baselines set by the University of Florida, Grooms and Parker have worked tirelessly to create a comprehensive nutritional program for the field. Click here to find out more about Fancy Farms and the 4R Advocate Award.